25 March - 5 November. 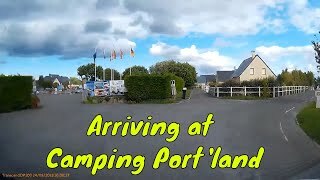 Camping Port’land, now a mature site, lies on the western edge of the delightful little resort of Port-en-Bessin, one of Normandy’s busiest fishing ports. The 279 pitches are large and grassy with 156 for touring units, all with electricity (mainly 16A), water and waste water, and 35 with hardstandings. There are 98 mobile homes for rent. The camping area has been imaginatively landscaped, many pitches overlooking small fishing ponds. An attractive modern building houses the refurbished reception and a smart bar/restaurant with an interesting menu. A coastal path leads to the little town, which has a number of shops and waterfront bars and restaurants. The nearest beach (the sandy Omaha Beach) is a short distance west, whilst for those for whom these beaches are still remembered for the dramatic events of 1944, the other Plages du Débarquement are all within easy reach. Beyond Cap Manvieux to the east lies Arromanches with its imaginative museum commemorating the D-Day landings. Just inland is the historic town of Bayeux, famous for its Tapestry but also an interesting destination for its architectural sites as well as its shops, bars and restaurants. A dedicated cycle track joins Port-en-Bessin with Bayeux, where there is an excellent network of cycle routes. Motorists are also well catered for following major investments in parking, making life easier and more pleasant for visitors. Main sanitary block is well maintain with controllable showers, washbasins in cubicles and an attractive baby room. En-suite unit for disabled campers. A second, more basic, block is open in high season. Heated swimming pool with paddling pool and retractable roof. 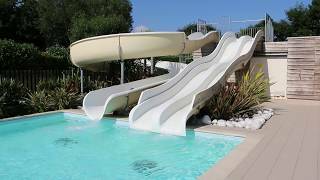 Open-air pool with slides (July/Aug). Shop, bar, restaurant with takeaway (all open all season). Wood-fired pizza oven (July/Aug). Large TV and games room (1st floor with lift). Multisports pitch. Fishing. Play area. Free WiFi in main building. 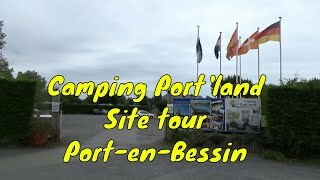 Port-en-Bessin is 43 km. northwest of Caen. From N13 (Caen/Cherbourg) leave at exit 38 and turn east on D613 towards Bayeux (this becomes northern bypass); in 10 km. turn north on D6 to Port-en-Bessin. Site is to west of village via D514 towards Omaha Beach. Site is signed on right in 1.3 km. along Chemin du Sémaphore and is then on right in 200 m.